Ball-Grip™ Chucks are used for first operation roughing and/or second operation finishing. 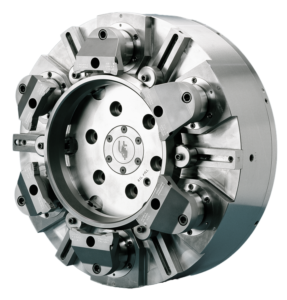 Our basic chuck is modified to suit machine mounting, the need for coolant and/or air thru, and mounting for top tooling which is designed to our customer’s part and machining requirements. Our Ball-Grip™ chucks are available in standard sizes up to 33″ (838.2mm) and special sizes up to 79″ (2m). Larger sizes available upon request. Centralizing, Compensating, Centralizing-Compensating, and Equalizing/Centralizing chucking mode. Pull Down or Pull-Back Action – Assist in providing positive location against work stop. Jaw Swivel (Homing) – Jaw compensates for part variation insuring 2 point contact with each jaw. Sealed Design – Sealed slides significantly reduce costly maintenance and resulting down time. Ball Joint Construction – Power mechanism operates within a sealed unit of high pressure lubricant. High Power Ratio – Higher gripping force with less input resulting in longer chuck life. Differential Chucking – Chuck allows for High-Low pressure chucking. Coolant and/or Air thru center bore. Quick change External/Internal chucking available for two and three jaw chucks. Quick change Jaw Mounting for rapidly changing work piece tooling. “W” series Platform style Jaw Mounting available to mount customers existing tooling. Counter Centrifugal option counteracts the negative effect of centrifugal force to accommodate high speed applications. All Ball-Grip™ chucks are push-pull drawbar operated. Self contained cylinder and spring actuated options are available as specials. Chuck Jaw Types include inserted and serrated jaws utilized on raw castings and smooth jaws utilized on machined surfaces. Chuck jaws individually locate on part diameter. Chuck centers work piece in two planes with jaws distributing clamping force equally to eight contact points on the work piece. Chuck centers work piece with jaws distributing clamping force equally to twelve contact points on the work piece. Grips thin wall work pieces with minimal distortion at a single chucking pressure.